Guriddo jqGrid PHP is written in pure PHP. This means that the class can be integrated in any PHP framework including Zend, Cake PHP, Doctrine PHP and much more. We support exporting the result to : Excel, PDF and CSV. The component also export the filtered and the whole data set. The export have a lot of useful configuration options. In the package we include two additional components at no cost. These are the Autocomplete and Datepicker. Both can be added and integrated into Guriddo jqGrid PHP with only one line of code. These two components can be used separately – i.e you can integrate it in any form. Again with the bonus components Autocomplete and Datepicker we provide a additionally two bonus modules – Guriddo TreeGrid PHP and Guriddo PivotGrid PHP. Both components handle automatically all server side operations and it is very easy to work with. Please visit the product pages and demo’s in order to get idea how is easy to work with it. Browser support is an important part of our grid. Guriddo jqGrid support all modern mobile and desktop browsers including the iPhone/iPad and Internet Explorer from version 8. 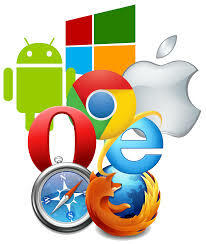 Browser support reference is tested regularly with all major browsers. The columns in the grid can be used as the basis for a search form to appear above, below, or in place of, the grid. We support single field searching, toolbar searching (placing the search fields below the headers), complex form searching and advanced searching with criteria defined from user. We can define a predefined search templates to make the search easy. Grouping is a way to group data by different criteria. Guriddo jqGrid currently supports a unlimited levels of grouping and different type of calculations to the group value applied to column. Currently we support the following build in functions: sum, count, avg, min, max. Also a custom summary type is supported. With grouping you can easy create a representative report. Header grouping is a way to add additional columns above the header grid rows, so that they are grouped in a way you need them. We support this feature in unique manner using two types of grouping – with colSpan enabled and colSpan disabled. If the colSpan is disabled (the default) the headers that do not have grouping have a additional cell above it. If the colSpan is enabled there is no additional cell above the non-grouped column and it is considered as one column. It is quit easy for developers to make some columns frozen/locked within Guriddo jqGrid. The locked columns do not scroll out of view when users moving horizontally across the grid. This is quite useful when you dealing with wide table with some fields should be visible permanently. It is needed to set this property in the model and call only one command. This is a special paging mode of Guriddo jqGrid where standard paging is disabled and you can request new pages by scrolling the scrollbar to the bottom. This is very convenient for getting large amounts of data page by page while keeping the interface simple. Since Guriddo jqGrid is a jQuery plugin it is very natural that in some cases we should not reinvent the wheel. That is the reason that we have made a decision to do some things in Guriddo jqGrid using the jQuery UI lib. Currently we have the following additions: Sortable columns – the method allow to reorder the grid columns using the mouse; Column Chooser – With this method we can reorder columns and set visible and hidden columns in the grid in visual manner; Sortable Rows – This method allows reordering (sorting) grid rows in a visual manner using a mouse; Resizable Grid – This method allow to re size the grid width and/or height in visual manner using a mouse. You can show any level of nested subgrids (master detail) inside a parent grid. It is needed to set the subGridRowExpanded function to construct another Child grid. PivotGrid – view data in diffrent perspective. See more here. CSS based themes. Guriddo jqGrid is compatible with UI Theming. Developers can change the grid skin by defining their own using the UI CSS Framework. Speed. The new rendering engine improves the loading speed in some cases up to 5-10 time faster than previous releases. Paging. This feature enables developer to display data page by page. Data will not be retrieved from the server until the end user comes to that page. Developers can control how many rows are displayed at a time. Resizable Columns. Column width can be changed by the end user. Sorting & various data types. The end user can sort records by clicking on the header of a column. Developers can specify sorting for various types including string, number, boolean, link, select and percent. Multiple Sorting. We can sort a grid by more than a single field. Event handlers & user API. Event handlers and various methods give you more flexibility without coding too much. Working with local data. Guriddo jqGrid can work with local data defined as an array. Seamless integration with any server side solution such as ASP, .net, PHP and perl. Multilanguage support (i18n). Currently Guriddo jqGrid supports more than 40 languages. 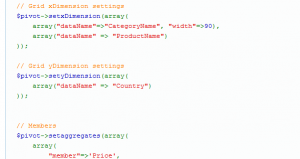 Support for XML, JSON and arrays as data sources. 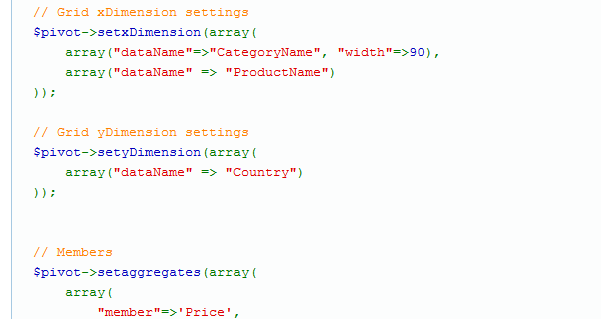 Another great feature is the possibility to define your own custom data type.